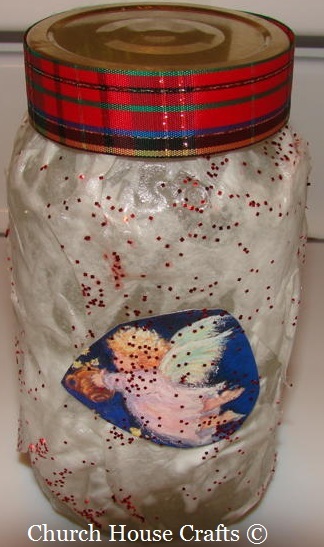 Take your glass jar, and smear glue all over.Tear up little pieces of coffee filters or tissue paper. Stick paper pieces all over jar. Cut your picture out from card, wrapping paper or magazine. Glue picture on front. Spray with sealer. Sprinkle glitter. Smear glue on sides of lid. Wrap ribbon around it. Fill your jar with some goodies now!